No matter what your own workout routines are, knee sleeves can help provide additional support and avoid injuries to your most vulnerable joints — your knees! One product that you might want to consider is the Mava Sports Knee Sleeves. They are recommended for both men and women who engage in cross training, WOD, powerlifting, weightlifting, squats, gym workouts, running and walking. They are proven to help athletes with their excellent features that are further stated below. Mava makes several different knee sleeve models for different applications. This review is going to cover the Mava Sports Neoprene sleeves. When it comes to features, Mava Knee Sleeves leads the way is benefits, advantages, and versatility. They have a thick 7mm design, which provides the best compression. They are anatomically shaped and have an ergonomic design for better stability. They are durable and built to last as evident with the double stitching. They are proven to increase performance. They provide orthopedic support to prevent any injuries from happening. They also help with joint pain recovery, which is especially useful during rehab. They help reduce inflammation and swelling by stimulating blood flow. They also helps relieve muscle stiffness, soreness, pain, and knee discomfort, including arthritis, osteoporosis, and tendonitis, during and after workouts. They have a heating effect and compression, which promotes muscular recovery and rehabilitation. They are very comfortable and efficient, with no unpleasant stiffness. The available sizes are small, which can fit 11.8 to 13 inches; medium for 13.0 to 14.2 inches; large for 14.2 to 15.7 inches; extra large for 15.7 to 17 inches; and double extra large for up to 18.3 inches. 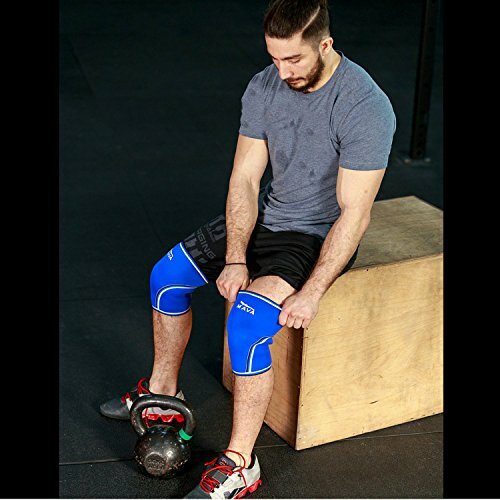 The fact is, even if you do not consider yourself as a professional athlete, you may still want to benefit from the use of knee sleeves in your regular workout routine. But, it is important that you get the right knee sleeve for your sports or physical activities that you do often. For instance, a person who lifts a lot of heavy weights may need a different type of knee sleeve from a person who performs a lot of squats. So, it is important for you to be informed about the factors that you should look for as well as the benefits of each knee sleeve available in the market. Also, it is important to note that knee sleeves are different from knee braces. Although both provide support for the knee, a knee brace provides support after injury while a knee sleeve provides support to avoid injuries and other damages. The support provided by Mava knee sleeves is essential for people who put pressure on their knees while performing a task or an exercise repetitively. When finding the best knee sleeves for you, there are a few things that you need to consider. The first one is to determine the type of activity that you usually do and the exercises that you will participate in frequently. For instance, will you be lifting weights? Will you be running or cycling? Or will you just be doing some power squats? If your activities will require more knee support, then you should opt for knee sleeves that are built with extra stability and compression. No matter what your workout routines are, knee sleeves may help in terms of providing additional support and comfort. One product that you might want to consider is the Mava Sports Knee Sleeves. They are recommended for both men and women who engage in cross training, WOD, powerlifting, weightlifting, as well as squats and other gym workouts. They are proven to help athletes with their excellent features that are further stated below. With athletes in mind, Mava Sports came up with these knee compression sleeves as they aim to provide a product that can help with knee support and valuable compression. The major purposes of these sleeves is to provide safety and prevent injuries among those who do CrossFit training, powerlifting, weightlifting, and other heavy duty workouts. What makes them special is the fact that they are anatomically shaped for better performance and for optimal support. They are also guaranteed not to slip off even when doing extreme exercises. Mava Sports knee sleeves can help not only professional athletes, but also sports and fitness enthusiasts with muscle recovery and rehabilitation. Aside from those who engage in sports, these sleeves can also be used by people who have knee problems and are in need of support and compression.